Ran in the Provo Canyon. Forgot The Toy (Garmin 305). Warmed up from the Canyon View Park to the Nunns Park, then ran the standard 3 mile tempo downhill in 16:11. Mile splits - 5:25 - 5:22 - 5:24. There was a small headwind, and it was raining. I also felt the lack of sleep. Jacob and Sarah somehow got stung by a wasp. The commotion woke me up at 4:40 am, and I did not feel like going back to bed especially since I did have a lot of things to do. So by 11 am I felt more like a nap than a tempo run, but more like a tempo run than just an easy run, or I would have taken a nap during the run otherwise. I wish I had brought The Toy to measure the heart rate. Based on the breathing, I think I had a hard time getting the heart to work. I would periodically speed up to a 1:19 - 1:20 quarter, and not have the mental energy to sustain the pace. Once I was finished with the tempo, I started jogging to make it 10 miles total for the run. After a mile I realized that this would be quite a drag. So I ran a tempo 1.5 uphill in 8:44 passing a runner that was going at a decent pace in the process. Then jogged a bit more and reached the turnaround point between the Canyon Glen and Nunns Parks. On the way back I met with the runner I passed earlier and asked him how far he was going. He had only 0.5 more to go before his turn around, so I decided it would be better to run 3 miles with a friend than 2 alone. The runner's name was Scott. 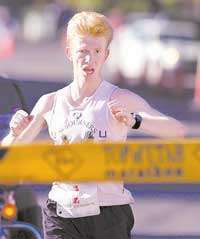 He had just run the St. George Marathon in 3:22. I invited him to join the Fast Running Blog crowd. Ran with the kids in the afternoon. In the evening did bench press 3x[5x105]. Cheston remarked that I already started training hard. Actually, this phase of my training is what I call active recovery - 60-70 miles a week, occasional tempo runs, no long runs, occasional races. This gives me a mental and a physical break to be ready to hit it hard in January or February - 80-90 miles a week, long tempos, hard tempos, interval work, race as often as I can. I believe a race is the best speed workout. Easy run with Ted early in the morning. 8 miles in 55:07. Chased the 7:00 guy, got him. Then decided not to get caught by ourselves running a week ago, and picked it up. Last three quarters according to The Toy (Garmin 305) were 1:29, 1:33, 1:32. Heart rate was normal at all speeds. It was cold and rainy. Also, set up the Fast Running Blog Store through Amazon. Ran with the kids. Then 5 miles with Brad Brown in 38:38. Then 3.25 more at about 7:00 pace to make the total 10 for the day. Warm-up from Canyon View Park to Nunns Park, then the standard 3 mile tempo downhill. Got more sleep (whole 6.5 hours) than last time, and it showed. Remembered to bring The Toy. Ran in the dark. Quarter mile auto-splits helped, but they were a bit off. The Toy showed 3.03 for the length of the run which I did in 15:59. I always subtract a second because back a few years ago the trail was slightly changed near the Canyon Glen Park to add about a second. I want the times to be comparable. So according to the protocol, the time was 15:58. According to The Toy, I hit 3 miles in 15:49. Ted's Toy measured it as 3.01. However, around 1.5 I had to swing out to pass two runners that were going about 8:30, which could have added a bit. With the speed difference of about 5 mph, and in the dark, it was not easy, not a lot of time to think. The pace was even through most of the run, but at the end I wanted to make sure I was under 16:00 and sped up. The Toy said I ran the last quarter in 1:14, but I think it was actually 1:17 - I managed to catch my split with a true quarter to go. HR stayed at around 158-160 after the first mile, and climbed to 168 on the last quarter. In the afternoon, Benjamin, Jennifer, and Julia ran in the Provo District Cross-Country Championship in the 3rd grade division. There was no home school team, so they ran for Provost. I believe Jenny and Julia ended up being the only girls representing Provost in the 3rd grade division. Julia (4 years old) ran very well - 5:10 for 0.5 mile, and she managed to pass some 3rd graders. Jennifer (6 years old) ran a decent 3:57 for 12th. Benjamin was not having a good day due to his stomach problems. Sarah, myself, and Benjamin have caught some food digestion bug - Benjamin and Sarah have it pretty bad, and I just do not feel like eating very much. Nevertheless Benjamin did his best under the circumstances and pulled off 13th place out of 52 3rd graders (a year or two older than him) with 3:37. I ran along with Julia, then with Benjamin, and then with Abby who finished 12th in the 4th grade girls 0.75 mile with 6:39. Saw Dr. Jex in the morning. He took an X-ray of my neck and did some other tests. He will go through the results on Monday. On the way back Sarah dropped me off in the park where the Provo River Trails crosses Geneva Road. First took Julia on her 0.25 mile run. Then ran 2.5 miles out to the end of the trail, and then back home. First 5 miles in 33:12. No HR measurements as I forgot The Toy. The some unknown distance to the house we've made an offer on. Assumed I was still on 6:40 pace, passed it at 42:21. It is 3.05 from there to our house. With a mile to go, noticed I was 15 seconds behind the 6:40 guy. The last mile was uphill, but I decided to get him anyway. Ran the last mile in 6:16 for the total of 1:02:32 for 9.40 miles. Ran with the kids in the evening. Benjamin and Jenny are racing in the Homecoming tomorrow, so only 0.5. Benjamin has not been feeling well - does not have much of an appetite, neither do I, or Sarah. Looks like we all got the same bug. Provo Canyon with Ted in the morning. Woke up at 2:45 am, and could not sleep because of the stomach nausea feeling. No throwing up, but not much appetite. Stayed awake until it was time to go, read the scriptures, got some work done, did my Pettibon exercises. Was originally planning on the same tempo run as Thursday, but decided to back off the pace a bit due to the low fuel condition. This might actually have been a good training - you feel like you are at about mile 15 of a marathon energy wise, but your legs are fresh. Stayed with Ted to help him run fast. Actually felt good for the condition. It was dark. The Toy gave quarter splits, which helped. We started out at 5:25 pace, I was able to see the true two mile split (10:59). Ted was very strong up to about 1.7, and then started losing it a bit. We ran the last mile in 5:38 for the total of 16:37. So Ted improved his time by over a minute in the last two months. HR stayed around 150-152 for most of the run except for climbing to 158 briefly during the kick at the end. Interestingly enough, that is where I had it during the second half of St. George. Ted said he would race when he broke 16:30 on our tempo run. He almost made it. I teased him that he slowed down on purpose at the end so he would not have to race. I think he will not be able to get out of it next week. I'll make sure to stay with him all the way to encourage it. Or who knows - the way he's been progressing he might just go ahead and drop me altogether. Afterwards, went to the BYU Homecoming races. Benjamin and Jenny ran the cross-country half mile. The course was hilly, and the grass was covered with ice. So that made for slow times. Benjamin ran a heroic race. He was still suffering from the stomach flu, so I told him to run it just to finish. His age division was again very tough - 7-9, and he is 7. He managed 3:48 which was good enough for 2nd. Jenny ran a good race finishing in 4:08, 2nd in 5-6. Afterwards, ran the 5 K pacing Ted's son James, who is 12. Ted could not do it himself because he was in charge of the parade. James ran a good race finishing in 22:59 on a hilly course around campus. Josh McAdams won in 15:02, very good time for that course. During the race, I did a lot of motivational talking and instruction. With Benjamin, I try to hold back a bit, he is only 7. He actually runs better when I am rather quiet, just there. James is 12, his dad is a tough army guy, so I figured I could do a little more. One girl running by wondered aloud how I could talk so much while racing. Ran with Julia and Hannah in the evening.